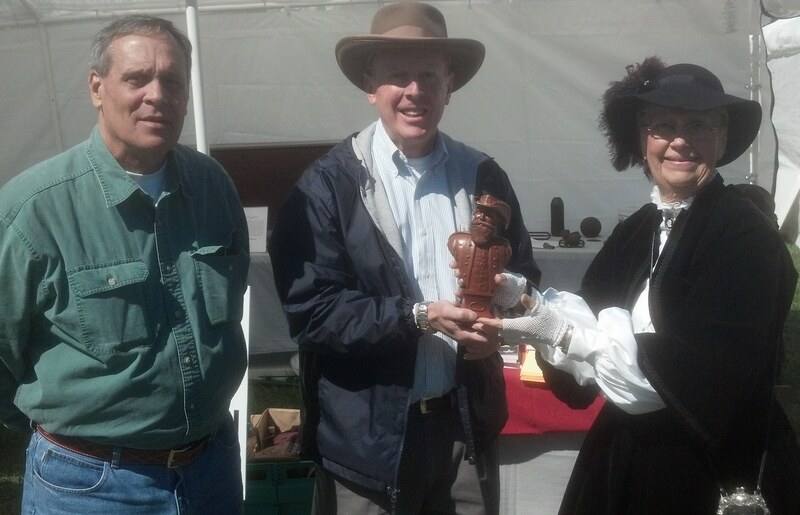 Receiving bust of JEB Stuart during Laurel Hill weekend in October 2014. JEB Stuart Preservation Trust President Shirley Keene and artist Allen F. Weidhaas. 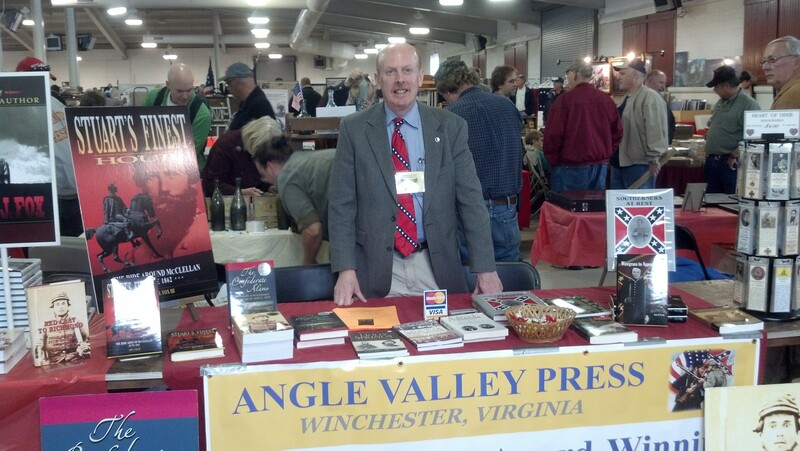 At the Angle Valley Press book table for the November 2013 Richmond CW Show. Saturday, December 14, 2013 – Richmond, Va.
Saturday – Sunday, November 16-17, 2013 – Richmond, Va.
Capital of the Confederacy Civil War Show @ Richmond Raceway Complex on Laburnum Avenue. Saturday 9-5 & sunday 9-3. Visit us at the Angle Valley Press table. Tuesday, November 12, 2013 – Winchester, Va. 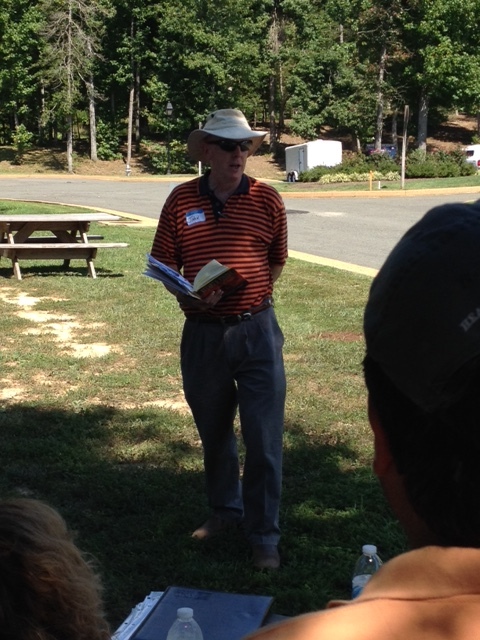 Presentation on Stuart’s Finest Hour and the Great Chickahominy Raid of June 1862 for the Turner Ashby Camp 1567, SCV. Tuesday, November 5, 2013 – Mechanicsville, Va. Presentation on Stuart’s Finest Hour and the Great Chickahominy Raid of June 1862 for the Cold Harbor Guards Camp 1764, SCV. At 6:30 pm, Italian Kitchen Restaurant, 7522 Lee Davis Road Mechanicsville, VA 23111. Saturday, October 12, 2013 – Winchester, Va.
Old Courthouse Civil War Museum. 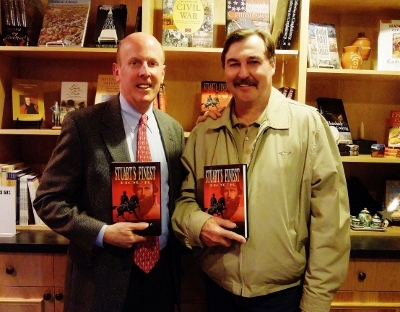 Brief presentation, book signing and book release party for Stuart’s Finest Hour: The Ride Around McClellan, June 1862. Shenandoah University McCormick Civil War Institute dinner. At 6 pm I will briefly discuss Stuart’s Finest Hour. Dinner at 7 pm. Location is OakCrest Realty on Kent St.
Friday, October 4, 2013 – Fort Shenandoah near Winchester, Va. I will be sharing a table with the Old Court House Civil War Museum at the North-South Skirmish Association meet from 1 – 4 pm. Tuesday, September 17, 2013 – Hanover Courthouse, Va.
At Hanover Tavern, 7 pm, Official National Release of Stuart’s Finest Hour: The Ride Around McClellan, June 1862. Sunday, May 26, 2013 – Staunton, Va.
Confederate Memorial Day ceremony, 2:30 pm, at Thornrose Cemetery. Sponsored by Jeb Stuart Chapter #156, United Daughters of the Confederacy. Tuesday, May 14, 2013 – Roanoke, Va.
Roanoke Civil War Round Table. Speaking on Jeb Stuart’s Ride Around McClellan: Skill, Luck or Incompetence? http://roanokecwrt.com/ 7 pm. at Friendship Manor, Florist & Hershberger Roads. Tuesday, March 19, 2013 – Charlottesville, Va.
Charlottesville Civil War Round Table.